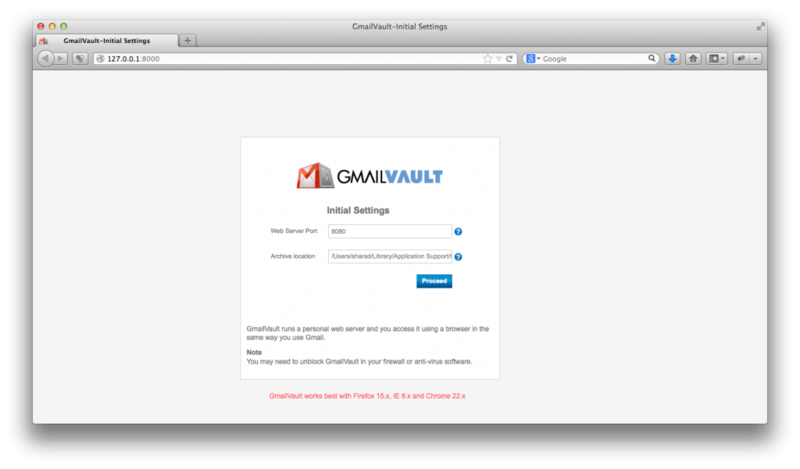 Setting up GmailVault to back up your Gmail | GmailVault – Gmail Backup! We assume you have downloaded and installed GmailVault for your Operating System. And made the necessary settings in your Gmail account. The Initial Settings screen allows you to configure the port GmailVault will run on, and, the email storage directory. The defaults should be fine for most cases. GmailVault will restart and the next screen asks you for your Gmail email-id and password. If all is well, simply press Backup. 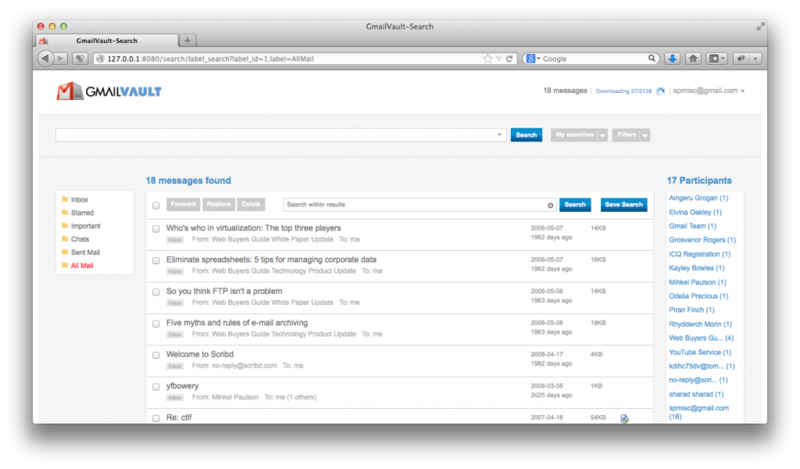 GmailVault has been specifically designed to be very easy to use, even by non-techies. In that spirit, this section does a step-by-step walk-through, along with screenshots (click them to enlarge). GmailVault is a web-application and includes a small, embedded web server. When you run GmailVault for the first time, it brings up your web-browser, which in turn opens a connection to the internal web server. At this point, you may be asked by your computer if you would like to allow GmailVault to accept incoming connections. Please say yes! The Initial Settings screen is where you configure the port GmailVault listens on and the directory (folder) where the downloaded email will be stored. The defaults are fine for most cases and you can simply accept them. GmailVault will restart automatically. If it doesn’t, simply start it once again manually. In the next screen enter your Gmail Username and Password. Click Test Connection. If the connection is successful, press Backup to start your backup. GmailVault gathers the necessary information from Gmail and begins the backup process. You can see the folder list appear on the left-hand side. Click All Mail to see your email (as much as has been downloaded). 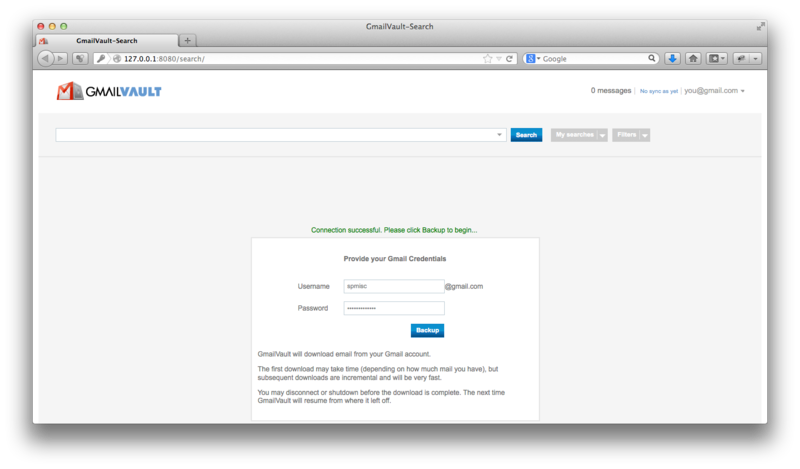 This is the main screen and work area for GmailVault. Feel free to explore. At this point, you may wish to grab a coffee (actually any beverage of choice) and relax, or go about your other work. The initial download can take quite a while, depending upon how much email you have in your Gmail account. In case you need to shutdown half-way, no problems. GmailVault will pick up from where it left off. Subsequent downloads are incremental in nature and will be much faster. I have looked from time to time for a simple gmail backup system and have tonight found your great and easy to use gmailvault and it’s free. For years I have been concerned about my gmail records always being aware that if I lost my emails I would have lost vital information that could never be replaced. I kept promising myself that I would “sort something out” and now I have with gmailvault being the simplest of programmes that can be used. Thank you for this wonderful, worry free and easy to use vital backup service.